Milan 2016: British fashion designer Paul Smith has created a new striped version of the cactus-shaped coat stand launched by Italian furniture brand Gufram in the 1970s. Smith updated the prickly-looking coat stand, which is one of Gufram's most iconic pieces, using a bright blend of pinks, blues and black inspired by the "hallucinogenic vibes" of the decade when it was designed. "Gufram and Paul Smith are two dimensions descending from the 70s", said Gufram's Charley Vezza. "The strength of this project lies in the fusion between two different worlds: Sir Paul Smith did not merely cover a cactus with colours, but he reimagined and transformed it by drawing inspiration from the hallucinogenic vibes of that crazy time period," he added. "The outcome is psychedelic, a creativity peyote." 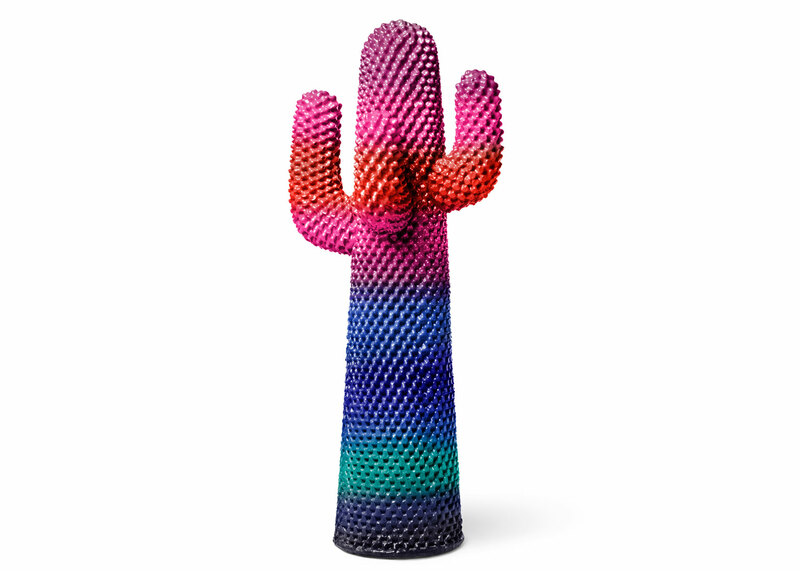 Smith's Psychedelic Cactus will be available in a limited edition of just 169, and will be presented during this year's Milan design week at Salone Del Mobile. "One of my favourite exhibitions of all time was Italy: The New Domestic Landscape in 1972 in New York's Museum of Modern Art," said Smith. "Included in the many wonderful things on display were products from Gufram." "Since then my affection for the products has never waned over the years and so I was delighted to have been asked to collaborate on their famous cactus," he added. Although Smith is most famous for his men's fashion design and tailoring, he has previously put his stamp on various furniture pieces, including the Anglepoise Type75 desk lamp and a selection of chairs by legendary Danish designer Hans J Wegner. A retrospective in 2013, named Hello, My Name Is Paul Smith, celebrated the designer's career across many disciplines, including his collaboration with MINI, his photography projects, and garments from his brand's archive. Gufram was founded in 1966 by Fratelli Gugliermetto. Other pieces by the company include a set of giant skull-shaped chairs by Fabio Novembre, and a daybed by Italian designer Emanuele Magini based on the blow-up mattresses used for lounging on the beach or floating in a swimming pool.